Hedi Slimane’s sophomore collection for Celine, held in Paris yesterday evening, marked a definitive about turn: though there was plenty to suggest it had been in the fashion auteur’s plans all along. Gone was the dishevelled after-dark glamour of season one – itself reflecting the look he pioneered during his tenure at Saint Laurent – replaced with a riff on the demure dress codes of the 1970s and 80s Parisian bourgeois epitomised by Celine of the era, albeit in his own defiant style. 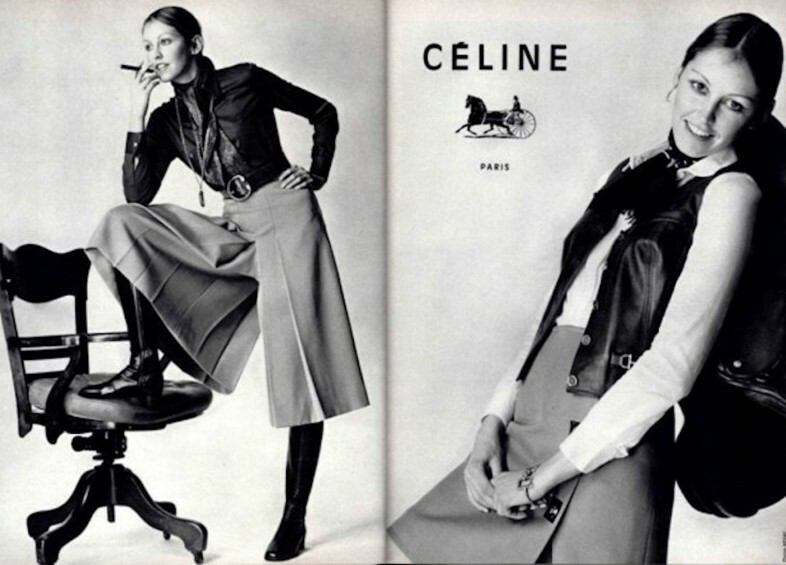 Here, we look at Celine campaigns of the 1970s – and the house codes that Slimane drew on for his Autumn/Winter 2019 collection. The classic: Upper-class Saint Germain dressing required the requisite horsebit hardware – whether across politely heeled leather loafers, as a skirt fastening or in lieu of a belt buckle, little says ‘bourgeois’ quite like a nod to leisure-time equestrianism. 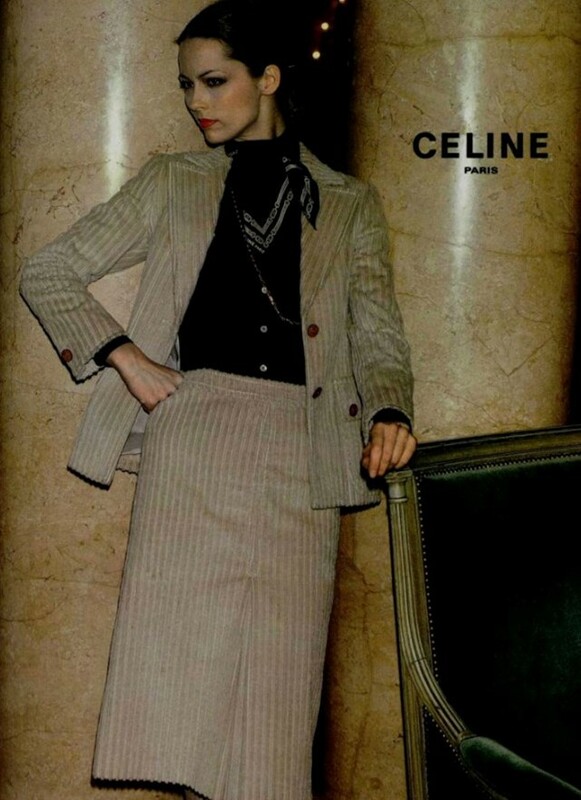 1970s Celine used the horsebit in abundance: it even inspired the house’s chain motif, which adorned silk skirts, scarves and all manner of accessories. The new: Horsebit hardware appeared throughout Slimane’s collection: from first look to (second) last. Primarily, it appeared as the fastening for slim, waist-cinching leather belts; but also appeared on pockets, skirts and as the clasp on handbags. Like the Celine of old, it took print form, too, decorating ruffle-yoke dresses and silk scarves, worn tied around the neck – a motif sure to be just about everywhere come September. The classic: The culotte too has equestrian roots: first worn by women at the turn of the 20th century, they gained popularity for their ability to let a woman ride astride a horse while maintaining her modesty. The 1970s and 80s saw the style return to the Parisian runways, favoured for the fact that they appeared as a skirt – Celine’s were pleated in such a manner you could hardly tell – yet allowed for complete freedom of movement, as with a trouser. The new: Slimane’s culotte was surprisingly classic – high on the waist, knee-length and pleated, they seemed to directly reference those found in the Celine archive. That said, the new iteration included quietly subversive new fabrications: from faded stone-washed denim to buttery black or mustard leather (the latter making for an impossibly chic belted culotte-jumpsuit worn by Léa Julian). The classic: The house of Celine was founded in 1945, by Céline Vipiana – bizarrely enough, as a made-to-measure children’s shoe company. 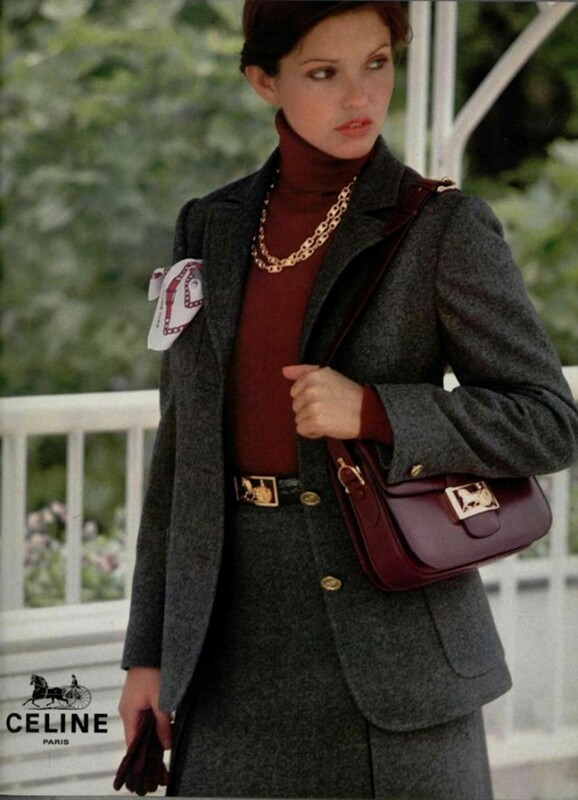 In the 1960s, however, the brand made the move into women’s ready-to-wear, and in 1966, it launched a line of high-quality leather accessories produced in Florence, with belts, loafers, gloves and the American Sulky bag its focus. The new: Slimane had already given us a teaser of what was to come for his line of ‘new Celine’ accessories, via the Triomphe cross body bag in quilted leather, with the ‘C’ logo emblem forming its closure taken from the house’s archives. With the A/W19 season truly heralding in M. Slimane’s vision for the house, we expect consumer desire for these particular shoulder bags are going to increase manifold (to be worn replete with those thigh-high shearling boots, of course). The classic: Whether on the streets of London’s Chelsea or the avenues of Paris’ seventh arrondissement, for a well-heeled lady of the late 1970s, a silk scarf – tied around head, neck or around the handle of one’s handbag – was a requisite accessory. Celine had plenty for such women, as evidenced by their campaigns of the era, where a silk scarf was rarely far from the shot, tied around the neck (or poking out of a pocket) in an insouciant Parisian manner. The new: Slimane was similarly enthusiastic about the accessory, tied around the neck in a bow (an echo of the neckline of the several pussybow blouses he also presented) in various styles of interlocking chain print. Those choosing to forego the silk scarf found plenty of décolletage-based interest elsewhere in the collection, whether the various ruffle-neck blouses or the entirely sequin-covered black polo-neck which closed the show with typical Slimane flourish. The classic: The original codes of Celine were all about practicality – Vapiana was a staunch advocate for creating clothes that women could live out equally fashionable and comfortable lives in. This revolved around skirts and vests in leather and suede, coloured denim, suiting, and fitted shirts. The day dress, a garment that could take you from the office in the day to the smoking terrace at after hours, was one of the key pieces developed by Celine, in silky, fluid silhouettes nipped in at the waist with a horsebit belt, or topped off with pussybow detailing. The new: For Celine A/W19, Slimane gave us dresses of a similar ilk, this time printed with snakeskin, and abstract patterns in brown, canary yellow and burnt orange tones. Perhaps our favourite of all, however, was the sweeping black pleated dress with a gold stripe, worn by Lara Mullen, paired with a slick leather over-the-knee boot. Très, très bien.